Cynthia generously offered me a ride from Chicago to Oshkosh and I wasn’t going to say no that. We set out early Monday morning, but before heading to Oshkosh we had to make a small detour to return a rented Sno-Cone machine. No, really. Once we dispatched the Sno-Cone machine were on our way to OSH. As is required by law (not sure which one, but I bet it exists), we stopped to pick up some Wisconsin cheese curds. If you’ve never had cheese curds, I highly recommend it. They are delicious and they squeak when you eat them. We arrived at OSH just in time to time see the afternoon air show begin. The AeroShell Team started things off while we made our way from the parking lot to the admissions gate. At this point I must confess that this was my first time at OSH. I’ve lived in Chicago nearly all my life and Oshkosh is only a few hours away, yet I’ve never made the trip. Walking in the gate for the first time and seeing rows and rows of aircraft on static display while an acrobatic team performs directly above was a bit overwhelming, but it set the stage for what turned out to be an amazing experience. 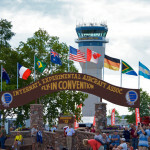 We headed down the main drag, Celebration Way, making our way through the static displays of Beechcraft, ICON, and more to Phillips 66 Plaza where a number of the featured aircraft, like the HondaJets, DC-3, and B-24 were parked. We made it to the Plaza just in time to see a formation of 18 T-34 Mentors fly over. From the Plaza we explored some of the culinary options at OSH, which were quite good for “festival food.” Each stand offered a taste of a different country, with China, Thailand, Germany, and of course, America among those represented. Being in Wisconsin, I availed myself of the “Taste of Germany” and was not disappointed. After lunch we headed down to the flight line to watch the airshow and wander through the homebuilt area on our way to see the Warbirds. Many of the homebuilt aircraft are vintage replicas, like the Johnson JCB-1. Out past the homebuilt area is Warbird Alley, featuring the best of military aviation from World War II to the present. 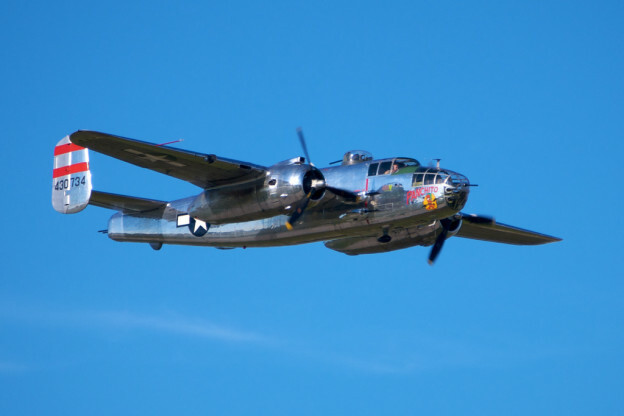 Most of the aircraft were from the 1940s and 1950s, so it was great to see so many older planes up close. 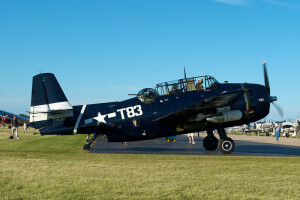 At Warbird Alley we were able to see a TBM Avenger taxi and depart the show and climb inside the bomb bay of a B-25 Mitchell bomber. As we walked back towards the main area near the end of the day we spied the beginnings of six hot air balloons inflating. We stood around for a while watching the crews inflate the balloons and I even got to hold one of the tether ropes. 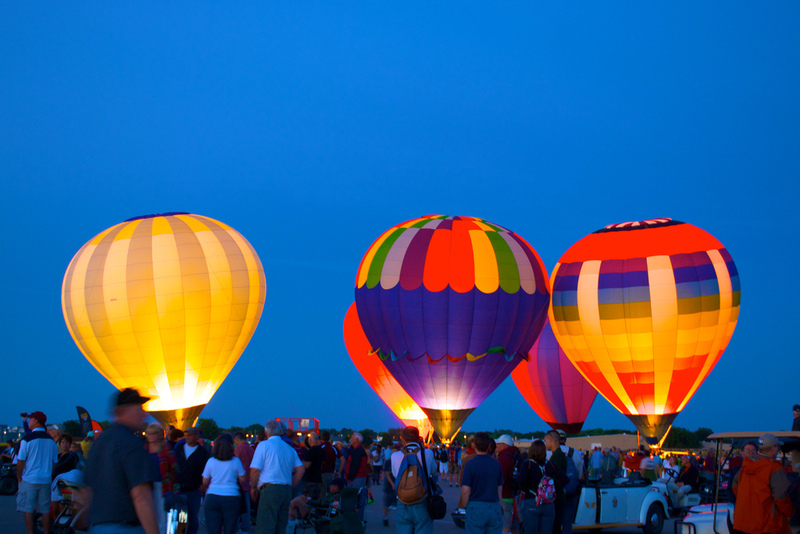 There is something magical about seeing half a dozen hot air balloons all light up against the night sky. It was the perfect end to a day at Oshkosh and I will definitely be back next year. For all the photos I took at OSH, including some very close shots of planes you don’t see on a regular basis, check out my Flickr page.